Last night was the opening reception for the Michigan Quilt Artists Invitational quilt exhibit. 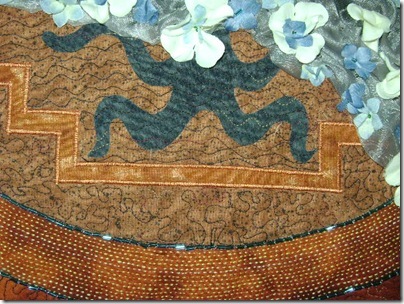 It’s always fun to see how other quilters translate the theme. I saw flowers, quilts that looked like clay tiles, landscapes, mola designs, and a quilt with the cover of Gene Autrey’s album “South of the Border” on it. The gallery was PACKED with people, so much that it was hard to get around and see all the quilts. There were a lot of college students in attendance – which was GREAT! 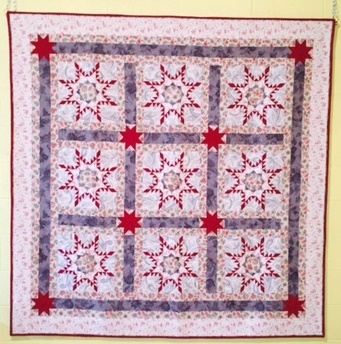 It showed any art majors that quilting is another option for artists. The title “2013: Mayan Tree of Life Lives” is in reference to the 2012 phenomenon that says based on the end-date of a 5,125-year-long cycle in the Mayan Long Count calendar, the world will end on December 21, 2012. For further information about this, visit http://www.december2012endofworld.com/ . In the middle is the Ceiba Tree which is the sacred Tree of Life of the Maya. Incense was important to the Maya; it was said to manifest and gratify the presence of the gods, with fragrance being a divinity attribute. The incensario at the bottom right corner is based on ancient Mayan artifacts and when lit, raises the fragrance of life up towards the heavens. The quilt has 100 percent cotton, netting, fused applique, beading, silk flowers, hand and machine embroidery, oil pastels, with machine quilting. I don't know how people can work with so much black; my eyes would give out! Glad to hear it was so well-attended – and college students, even better! 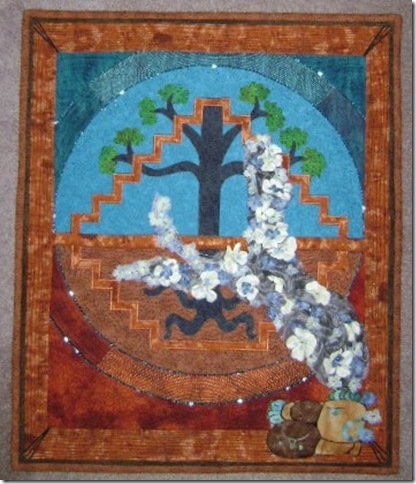 Your quilt is so beautiful, Caron, and I love what you added to the smoke. That is just perfect.